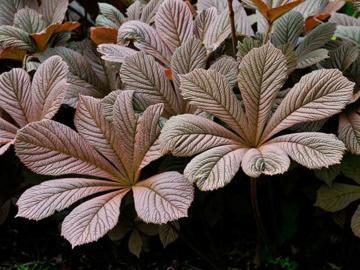 Large very distinctive, deep-veined, palmate leaves, reminiscent of horse-chestnut, strongly flushed with bronze when young. The flowers are cream or sometimes pinkish and are held well above the foliage. Needs moist, but not totally waterlogged, humus-rich soil, in full sun or partial shade. Will not tolerate dry conditions. May be damaged by slug attacks. By seed or division in early spring. Very suited for growing near water or in the bog garden. Architectural foliage of interesting colouring in spring and flowers later.